This is a very interesting picture looking almost due south at the dam before the lake filled. We can see the eight turbine inlets in the foreground and floodgates in the background below the gantry cranes. 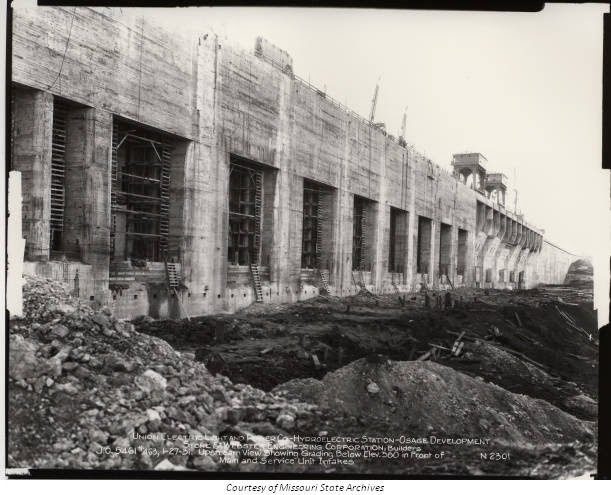 What's notable is the smaller gates at the far left, nearly half the size of the others, used for the "service" turbines to supply power to Bagnell Dam itself for operations. Restricted only by permitted water flow, the Osage Energy Center is capable of using all ten generators to produce electricity for the grid.